Fewer than one hundred outsiders have joined the Old-Order Amish---and stayed---since 1950. Marlene C. Miller is one of them. Against the wishes of both sets of parents, Marlene and Johnny get married and begin a family. Follow the author on this unusual journey to find out how God's love called her out of bitterness and depression and into the warm embrace of her new Amish community. Accompany her as she dons an Amish dress and prayer covering and gets baptized. Learn how she endures the strain of ten children, a hundred-acre farm, and accidents and tragedy, and find out how she comes close to walking away from it all. Turning Amish has proven to be anything but plain and simple for this former majorette. 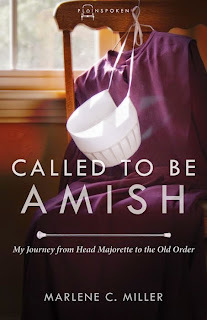 But nearly fifty years later, Marlene is still living out God's call as an Old Order Amish woman. I have so many thoughts about this book I'm not even sure where to start! For one, I was kind of amazed that an Amish person would write a book, but then I discovered it was hand written and this publisher specializes in the stories of Amish people. At first I was kind of put off because it felt like I was just sitting down for tea with someone and listening to them ramble about their life. Eventually I realized it worked for this kind of a story. Essentially it is a ramble, through someone else's life. There's not a lot of suspense, but I think the intrigue is in getting a picture into a lifestyle that is pretty foreign to most of us. Marlene doesn't ever really explain much of the "Why" they live this way, perhaps because she joined as an adult and even then didn't speak the language well enough to understand the classes they took before joining. Which is not to say that her conversion was a sham at all, only that if you're wondering about the reasons why the Amish live the way they do you won't find it in this book. I did find her personal story of her intersection with God that changed her life really authentic. To go from being "English" as they call outsiders to being Amish would take something more than just a desire to experience something different. This is why so few people join and truly stay for life. There are things about the Amish that bug me, like not owning cars, yet hiring people to drive them around. Or not using electricity, but having gas powered generators. But I think the focus of this story was more on the relationships in her life and how living in the Amish world is truly living in community. That's something we could use a lot more of in our lives today. Overall, a pretty fascinating and easy read. In the Q and A at the end the author talks about having seen some reality show about the Amish and being appalled at what a poor representation if was. Can't be too surprised, it's Hollywood! But it did remind me that during the summer of 2004 when I was in grad school there was a short run of a show called Amish in the City in which they had 4 or 5 Amish kids, before they'd decided if they were going to join the church, living with 4 or 5 "normal" American kids (probably all in their late teens and early 20's). It was interesting as they were trying to get the Amish kids to have all kinds of new experiences. I just remember coming away from it thinking how normal the Amish kids were though compared to the crazies they managed to have representing average Americans! Find other reviews or purchase your own copy.